In the presence of Serbian President Aleksandar Vucic and European Commissioner for Neighbourhood Policy and Enlargement Negotiations Johannes Hahn, the Head of the EU Delegation to Serbia Sem Fabrizi and the Minister of European Integration Jadranka Joksimovic signed an Agreement on the implementation of IPA programme worth slightly over EUR41 million to be used both by the justice sector and as a form of support for further integration. The European Commissioner Johannes Hahn said that the signature of the Agreement reflected EU’s full commitment to the European integration process Serbia is going through. Following the meeting with Serbian President Aleksandar Vucic in Belgrade, Hahn said that Serbia received some EUR200 million a year to align its standards with EU acquis, adding that thus far, the EU has provided Serbia with some EUR2 billion in grants. “The process of European integration is all about Serbian citizens, not about pleasing some European official or a bureaucrat,” the Commissioner said. Hahn said that a portion of IPA money would be used for the rule of law reform, judiciary in particular, and to strengthen Serbian public administration. He said that EUR26 million would be directed towards judiciary reform, leading to a more independent and efficient system of justice delivery. “The support will be aimed at the State Prosecutorial Council and the High Judicial Council in order to increase the efficiency and transparency of their work,” Hahn said. He also said that a part of the support will be directed towards improving working conditions for judicial staff and the establishment of a case management system at a new department in Novi Sad, in line with Union’s norms and standards. “The rule of law is at the very heart of accession negotiations, but what is also pivotal for Serbia is to become more attractive to investors,” Hahn said. Hahn said that EUR41 million is not much, but is indeed a portion of large financial assistance the EU addresses to Serbia. “It reflects our strong commitment to Serbia’s European integration process,” Hahn said and added that on average, EU’s financial assistance amounts to around EUR200 million annually. “We have provided Serbia with EUR2 billion in grants over the past decade. Since the signature of the SAA, Serbian exports to the EU have tripled and are increasing at a 10 per cent rate,” Hahn said. Noting that he will refrain from mentioning Kosovo as a pending issue, Hahn said there are “many other crucial elements” to be dealt with by Belgrade and the Union as the accession negotiations progress. Serbian President Aleksandar Vucic said he was not optimistic when it comes to the outcome of Belgrade-Pristina dialogue. He said that many things were not up to Serbia, but he reiterated that the dialogue must continue as it keeps the peace and stability of the entire region in check. He added that he and Hahn discussed other issues of relevance to the region, including Belgrade-Pristina relations, but also possible avenues to improve the area of rule of law. “I completely agree with Commissioner Hahn, especially the part about the rule of law, and I am convinced that we will make progress before the next Report is published,” Vucic said. 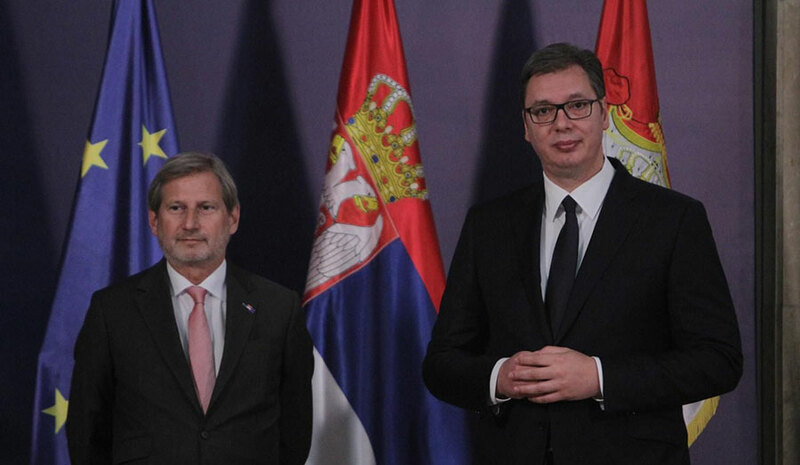 Vucic said that the total EU assistance to Serbia in 2018 amounted to EUR138 million, adding that there are signs it would further increase in the coming period and that Serbia wants to seize all opportunities offered to it as an EU candidate country.